(Minghui.org) Mr. Li Zongze’s father was arrested in January 2014 for practicing Falun Gong, a spiritual practice that has been persecuted by the Chinese regime for the past 17 years. In seeking his father’s release, Mr. Li was arrested three times. He was beaten by the police, illegally detained, interrogated, and fired from his job. On September 5, 2014, the police assaulted him for inquiring about his father’s case. Two weeks later, when the court discharged the defense attorney that the family had hired for his father, Mr. Li took the lawyer’s place and defended his father. After the court sentenced his father to prison, Mr. Li tried to visit him at the detention center in July 2015. The police officers there beat him and detained him for 24 hours. Mr. Li and his parents filed a criminal complaint against former Chinese Communist leader Jiang Zemin for ordering the persecution of Falun Gong on June 20, 2015. Two days later, Mr. Li filed a separate criminal complaint against Jiang Zemin for the injustice the family had suffered. For filing those lawsuits, Mr. Li was arrested at work on November 20. He was detained for 10 days, beaten, and fired from his job. The following is an excerpt from Mr. Li’s lawsuit. After my father started practicing Falun Gong when I was four years old in 1997, he got rid of his bad habits, such as smoking, drinking, and gambling. He often told me to think about others first and to follow the principles of Truthfulness-Compassion-Forbearance. At the time, I didn’t really understand it, but I knew he was a good man. One time on our way to visit my grandparent, we saw an elderly man fall out of his wheelchair. He tried to get back in several times but just couldn’t manage it. People were passing by, but no one stopped to help him. My father did stop and helped him back into his wheelchair. He never said anything about it, but it left a deep impression on me. My father was taken to a detention center from work in November 2001 after the persecution of Falun Gong started in 1999. He was only released after we paid 2,000 yuan in extortion to the police. Just five months later, he was taken to a brainwashing center. My mother didn’t know what to do, and she cried every day. Totally stressed, she sent me to stay with my father in the brainwashing center. I was nine years old at the time. I was terrified to see police officers everywhere and every room under strict surveillance. Eventually, the police send me home after repeated requests from my father. My father was forced to resign from his job in 2012, because he refused to denounce Falun Gong. He opened an electronics shop to make a living. In January 2014, over a dozen police officers broke into our home. My father was arrested again. His shop was forced to close. One time when my mother went to the police station to ask about my father, a police captain said something to her. By the time I got there, she had already tried to kill herself by hitting her head against the wall twice. For the two months after the incident, she could hardly eat or sleep. Her spirit was completely broken. When my 83-year-old grandmother went to the police station to visit my father, the police pushed her out before she could say much. During my father’s trial, the court removed his defense attorney because he entered a not-guilty plea. I decided to defend my father myself. The prosecutor accused my father of having Falun Gong videos on his computer, even though that does not constitute a crime under any law. When I tried to present evidence about the benefits of practicing Falun Gong, the judge interrupted me repeatedly. He didn’t allow the witness to testify for my father either. 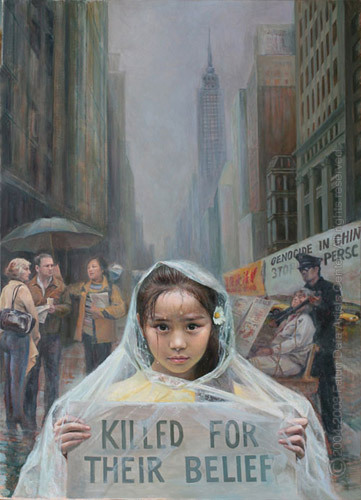 The persecution has led to the deaths of many Falun Gong practitioners during the past 16 years. More have been tortured for their belief and even killed for their organs. Jiang Zemin is directly responsible for the inception and continuation of the brutal persecution. Under his personal direction, the Chinese Communist Party established an extralegal security organ, the “610 Office”, on June 10, 1999. The organization overrides police forces and the judicial system in carrying out Jiang’s directive regarding Falun Gong: to ruin their reputations, cut off their financial resources, and destroy them physically. (Minghui.org) Liang Jinfeng (nicknamed Xinxin) still remembers when his mother dropped him off at his grandma’s house one Friday afternoon when he was only three years old. She told him that she would pick him up the next day. But it would be eight months before he saw his mother and father again, when they were being tried for refusing to renounce Falun Gong, a spiritual discipline being persecuted by the Chinese communist regime. Xinxin’s life was forever changed that Friday afternoon. He is nine years old now and living with his grandmother outside of China. Xinxin’s mother dropped him off at his grandma’s house on August 20, 2010. When she didn’t come to get him for two days, he became anxious. The next morning, Xinxin and his grandmother took the two-hour trip to his parents’ home in Guangzhou City, Guangdong Province. They found a newly installed padlock on the front door, along with caution tape. Xinxin and his grandma went to the local police station and found out that his parents were arrested and their home was ransacked the night before. After that, Xinxin cried almost every day and asked his grandmother to take him back to his home to look for his mom and dad. A once happy child became quiet, irritable and unsociable. Xinxin’s grandmother, Ms. Luo Jinfeng, did not have any income. In order to rescue her daughter and son-in-law, the elderly woman spent her days visiting the court house, police station, and Procuratorate office. She also tried to find lawyers who would take on her daughter’s case. With all these things going on, she had no time to take care of Xinxin. So she sent him to preschool. However, Xinxin was not happy at school. He cried every day. One time, the teacher became very irritated by Xinxin’s crying. He slapped Xinxin and scolded him loudly. Another time, Xinxin didn’t do well during a competition. The teacher was angry and slapped him again. Xinxin still remembers that incident after many years. “He hit me so hard!” he cried to his classmates. But his teacher had no sympathy. “He is the son of an anti-revolutionary! He deserves it,” said the teacher to the other students. Terrified of being beaten and scolded again, Xinxin stopped going to preschool after two months. Eight months after his parents’ arrest, Xinxin finally saw them at a court hearing on April 29, 2011. When he saw the handcuffs on his mother’s wrists, he tried to pry them open. He held on to his father’s leg and wouldn’t let him leave. Xinxin’s mother was sentenced to two years in prison with three years of probation. She was released in April 2012. However, things did not return to normal for Xinxin’s family after his mother’s release. Xinxin’s mother, Ms. Luo Xiaojuan, had been severely tortured at the detention center. Several times she’d passed out from forced-feedings and had to be sent to a hospital in critical condition. For a long period of time after she returned home, she couldn’t remember where her home was or what she’d done a short while ago. In order to make a living, Xinxin’s grandmother and mother decided to open a convenience store. But the store was robbed soon after it opened. Within a month, thieves had stolen cellphones, money and ID cards from Xinxin’s mother three times. Xinxin’s aunt was also robbed on the way home after work. Unable to keep the store open, the family moved to Panyu District. But they soon found out that they were being monitored by the police. Their home was broken into several times. The family moved seven or eight times to avoid harassment from local police. Xinxin could not stay at the same school either. Often, as soon as he got familiar with one school, his family would have to move. In August 2013, Xinxin’s dad, Mr. Liang Dong, was released from prison after serving three years. He had high blood pressure and skin irritations. He had been severely traumatized and was afraid his loved ones would suffer as he had. Xinxin cried and told his grandmother that he didn’t want to stay at this home anymore. With the consent from her daughter and son-in-law, Xinxin’s grandmother took him to a different country, where she and her grandson can freely practice Falun Gong without fear. In June 2015, Xinxin’s grandmother filed a criminal complaint against Jiang Zemin, the former leader of the Chinese Communist Party, for the suffering her family has endured. Xinxin also signed his name on the document. The persecution has led to the deaths of many Falun Gong practitioners over the past 16 years. More have been tortured for their belief and even killed for their organs. Jiang Zemin is directly responsible for the inception and continuation of the brutal persecution. Above is an excerpt from a criminal complaint Mr. Yu Fenglai filed against former Chinese dictator Jiang Zemin, who launched the persecution of Falun Gong in 1999. Mr. Yu Fenglai, a former major in the armed police, served in Shandong Province. He had been hospitalized three times, but recovered his health after he started practicing Falun Gong in 1997. After the persecution of Falun Gong started, he went to Beijing to appeal for Dafa on January 2, 2000. He was arrested and stripped of his rank. Later, he was given two years of forced labor. The 52-year-old man holds Jiang Zemin responsible for his torture and forced labor. He mailed his criminal complaint to the Supreme People’s Court and Supreme People’s Procuratorate on September 16, 2015 and received a notification that it was received on September 18. Mr. Yu was placed in the “Intense Discipline Unit” of the Shanxi Armed Police Forced Labor Camp. The leaders of the unit were instructed to beat the inmates, especially Falun Gong practitioners. Mealtimes were extremely brief. Even when Mr. Yu ate very fast, he still couldn’t finish his food. He was hungry all the time but still had to do heavy labor. Hungry and exhausted, he ate weeds and worms in the fields where he worked. There was no rest when the work ended. He and others were forced to stand in rows until it was time for bed. A special “transformation group” was set up specifically to target practitioners in the military to give up their belief. The staff interrogated him to place more pressure on him. Other than when he slept or worked, Mr. Yu was interrogated night and day. Some of the perpetrators made clever arguments, and round after round, the interrogations got more intense. Mr. Yu was exhausted. They offered inmates possible early release to help them wear Mr. Yu down. When they realized that they could not “transform” Mr. Yu, they humiliated him. They knew he respected Master Li Hongzhi, the founder of Falun Gong, so they placed pictures of Master under his bed, forcing him sleep on them without knowing it. They placed Master’s picture on a blackboard and wrote slanderous words on it. They ordered Mr. Yu to step on Master’s picture. If he didn’t, they would beat him in front of his former colleagues. They would lift him up and throw him on Master’s pictures. They gathered all the inmates and forced everybody to shout words and sing songs that slandered Falun Gong. At Mr. Yu’s young son’s elementary school, they forced the boy to write letters to persuade Mr. Yu to “transform.” They made Mr. Yu write down his “thoughts” every day. If he refused, they would punish all of the inmates, making them stand out in the sun with him for a long time to instigate hatred against him and Falun Gong. The torture continued, day after day. Finally Mr. Yu did not have any energy left. He could not handle it anymore. With pain in his heart, he gave in. For a period of time, the torture stopped. Mr. Yu knew it was a huge mistake to give in, so he told them that he had been forced to do it and that his belief in Dafa would never change. He was put right back into the Intense Discipline Unit. A new round of torture started. This time, it was physical torture as well as mental. They forced Mr. Yu to go through intense military drills, which challenged him to an extreme. They limited his food and water. He was deprived of sleep. His health deteriorated, and he passed out multiple times. After a full day of torture, Mr. Yu had very limited time to sleep. Two people took turns watching him every night. The moment he fell asleep, they would wake him up. Those in charge of the “transformation” group told him that they could easily make him insane, but that their goal was to “transform” him. He suffered so much and was at the brink of insanity. A senior-ranking official from the Armed Police came to visit the camp and gave orders that Mr. Yu be transferred to the Wangcun Forced Labor Camp in Zibo, Shandong Province. Mr. Yu was carried into the Intense Discipline Unit at Wangcun by two guards as soon as he arrived at the camp. Brainwashing sessions began right away. He was extremely weak when he arrived. They struck him on his hands, arms, legs, and head with a wooden board. They deprived him of sleep. They were convinced that, as long as Mr. Yu was clear-headed, he would not give in. They forced him to take unknown medication to affect his mind. With the torture and the effects of the unknown drug, Mr. Yu was disoriented and mentally confused. (Minghui.org) Three Falun Gong practitioners from Jingtai were arrested in recent months after filing lawsuits against former Chinese dictator Jiang Zemin. The lawsuits charge Jiang with launching the persecution of Falun Gong. One of the practitioners has already been tried. Trials for the other two have been scheduled. Mr. Wang Yichao was arrested on August 27, 2015, and tried without his family’s knowledge on December 18. The court declined to accept the lawyer hired by Mr. Wang’s family and appointed one for him instead. Despite the lawyer’s repeated protests, the local court refused to grant him access or allow him to be involved in the case. Consequently, Mr. Wang’s family has no clue how things are shaping up for him. Ms. Wang Lianzhen was arrested on October 14, 2015, and is now facing trial. The court has ordered her family to hire a local lawyer for her. Mr. Yu Youzhen was arrested on January 26, 2016, along with his wife and two grandsons, who were later released. Mr. Yu is now facing trial and is forbidden from using out-of-town lawyers. The police threatened to arrest his two grandchildren again if Mr. Yu refuses to hire a local lawyer. Mr. Yu recovered from his health problems after he began practicing Falun Gong in 1995. He no longer needed to spend large sums of money on his medical care and he also improved his relationships with family and neighbors. For refusing to give up his faith, however, he was repeatedly harassed, threatened, and detained. He was first arrested in early 2000 and held in a local detention center for one month, during which time he suffered a broken rib in a beating. Six months later he was arrested again for going to Beijing to appeal for the right to practice Falun Gong. After being kept in a detention center for one year, he was transferred to the Pingantai Forced Labor Camp for a year. The local authorities ransacked his home in March 2003, but he managed to escape and avoid arrest. While Mr. Yu lived away from home, the local police extorted money from his wife, who later joined her husband in Baiyin to do odd jobs. Mr. Yu filed a lawsuit against Jiang Zemin on May 25, 2015, only to be arrested in January this year. (Minghui.org) Ms. Zhang Lixia from Guangzhou was harassed and threatened several times after she filed a criminal complaint against former Chinese dictator Jiang Zemin last year. Jiang initiated the brutal persecution of Falun Gong practitioners in 1999. Under Jiang’s campaign, Ms. Zhang was put through two terms in a forced labor camp and arrested, detained, and tortured numerous times during the past 15 years. The first visit to Ms. Zhang’s home in response to her criminal complaint was on December 29, 2015, when four officials from the local 610 Office, police station, and residential committee forced her to go to the local residential committee office. They questioned her and let her go home afterward. Five officials came back to Ms. Zhang’s home on January 13, 2016 to try to force her to sign a “guarantee letter” promising to give up her practice of Falun Gong. After she refused, they threatened to send her to a brainwashing center. Three officials came to Ms. Zhang’s home again on February 2. Her family members refused to open the door, since she was not home. They again threatened to send her to a brainwashing center. An official from the local residential committee called Ms. Zhang’s home on February 23, demanding that she come to the office to sign a form promising not to file criminal complaints or appeal for Falun Gong in the future. She was threatened again for refusing to cooperate. Ms. Zhang began to practice Falun Gong in 1991, after which she recovered from hepatitis B. Like millions of Falun Gong practitioners, she refused to give up her faith after the persecution began. Instead, she went to Tiananmen Square on October 24, 1999 to appeal for the right to practice Falun Gong. She was arrested, interrogated, tortured, and released after 15 days of detention. Ms. Zhang was arrested five times in 2000, resulting in a combined 53 days of detention and 7 days of house arrest. She held a hunger strike to protest her mistreatment during her 15 days of detention from June 18 to July 3, 2000. While four men held her down, a female officer pried open her mouth using a metal spoon and a vaginal dilator, breaking one of her teeth in the process, and forced porridge, hot water, and hot chili water down her throat. When she struggled, the chili water entered her lungs, rendering her unable to breathe for a full minute. When she violently sprayed the pepper water all over the floor, one of the guards shrieked in alarm, perhaps thinking she had died. While they did not force-feed her again, she did not cough up the last of the red pepper flakes until a month after she had left the detention center. Ms. Zhang was arrested again on December 31, 2000 in Beijing and held in the Haidian District Detention Center, where she was sexually assaulted by guards, beaten, shocked with electric batons, exposed to extreme cold, and brutally force-fed. That year was the coldest winter in Beijing. Upon entering the detention center, Ms. Zhang was stripped and forced to squat naked in an office. If she did not cooperate, three female guards would pinch her breasts, touch her between the legs, and twist her arms behind her back. To extract information, officers interrogated her using torture each day at midnight. They whipped her face with a rubber ruler until her cheeks were swollen, her gums were bleeding, and her lips were split open. They also punched her in the forehead, causing a large bump. Finally, officers shocked her in the head with high-voltage electric batons, and she felt as if she was being stabbed by thousands of needles. Afterwards, the lightest touch would cause excruciating pain, making her unable to sleep for some time. The next day, the officers were shocked to find that her hair had turned white overnight. Ms. Zhang still refused to cooperate. They continued using the “flying an airplane” torture on her, and kicked her whenever she didn’t conform to their demands fully. This lasted for half a day. One time, they locked Ms. Zhang outside the gates in her pajamas for half an hour in heavy snow. Another time, they challenged her do the Falun Gong exercises outside on packed snow. After she sat in meditation for half an hour with no issues at all, they angrily dragged her back inside. Practitioners detained at this center were forced to go through medical examinations every other day. Those in good health were eventually sent away. Ms. Zhang failed the examinations and was later given 18 months of forced labor. She was first detained in the Xin’an Forced Labor Camp and then transferred to the Beijing Women’s Forced Labor Camp. She was forced to work long hours and punished by being forced to stand still for long periods of time and deprived of sleep. She was released on June 30, 2002. Ms. Zhang was arrested again on July 20, 2009 and given another two years of forced labor. (Minghui.org) Ms. Xu Fengqiong, a former employee of the Tibet Military Printing Shop, filed a criminal complaint against former Chinese dictator Jiang Zemin with the Supreme People’s Procuratorate on August 12, 2015. She holds Jiang accountable for the mental and financial suffering she and her family have endured under the communist regime’s violent persecution campaign against Falun Gong. Ms. Xu was repeatedly arrested and detained for refusing to renounce her faith in Falun Gong. After she was released, she was not able to find a job or rent an apartment because the authorities would not re-issue her ID card. Listed as a “key figure” in the public security department’s electronic ID card system, Ms. Xu was monitored and repeatedly harassed by police. She was arrested again in 2005. Since then, she has lived in fear of being arbitrarily arrested at any time. Before her first arrest, Ms. Xu was evicted from her dormitory after her husband was arrested for practicing Falun Gong. She had to send their six-year-old daughter to live with her husband’s parents. Her own parents were also threatened and monitored frequently. Below is an excerpt from Ms. Xu’s personal account of what she and her family have endured. I was watched, followed, and harassed non-stop after the persecution of Falun Gong began in 1999. It was worse on “sensitive days” on the Chinese Communist Party’s (CCP) calendar. In 2001, agents from the 610 Office searched my home. Their brutality upset my family terribly. In the morning on May 20, 2002, I was told to report to a meeting room, where more than 30 individuals were present, including a Jinzhuzhonglu Police Station officer and two Chinese military officials. They assailed me with questions and accused me of many baseless crimes. They then confined me to a room in a hostel. I was not allowed to report to work or to go home. They wouldn’t let me use the phone or see anyone. They assigned four people to watch me around the clock. They beat me and tried to compel me to “confess.” Every day they pressured me to sign statements apologizing for practicing Falun Gong and promising to give up my faith. On June 4, I called my employer to clear the charge against me, but I was arrested and taken back to Lhasa and incarcerated in the Autonomous Region Public Security Bureau Detention Center. In detention, I was insulted and verbally abused because I refused to give up Falun Gong. I was not allowed to shower or talk to anyone else. The guards purposely searched me in front of my family during their visits. They also assigned criminal inmates to live in my building and provoke conflicts between others and me. I went on a hunger strike for five days to protest the abuses. The Lhasa City Forced Labor Committee sent me to three years of forced labor on July 16, 2002. My health was deteriorating, and I was diagnosed with hepatic cancer. When I was sent to Lhasa City Forced Labor Camp in March 2003, the camp refused to accept me because of my poor health. The detention center still incarcerated me until I was so ill that I had to be released on medical parole. We had lived in a dormitory assigned by the Autonomous Region Economic and Trade Commission, where my husband used to work. When my husband was arrested for practicing Falun Gong, the 610 Office and the local police station pressured the Commission to remove me from the dormitory. With no place to go, I had to send my 6-year-old daughter to live with her grandparents in Sichuan Province. I was fired from my job on July 29, two weeks after I was sent to a forced labor camp. When I was released, my former employer and the local police station refused to re-issue me an ID card. Without one, I could not find a job or rent an apartment, causing me great financial hardship. Fortunately, a good friend offered me a place to live, and a kind advertising shop owner offered me a job. Officers from the 610 Office and Tuanjiexincun Police Station spied on me around the house and made loud noises to wake me up in late night or early morning hours. They even came to my new workplace to harass me, and pressured the shop owner to fire me. To ward off the harassment, my friend had to buy them dinners, give them gifts, and provide them and their relatives free hotel rooms. The advertising shop owner also had to print materials for them free of charge. I was again arrested and taken to a 610 Office in 2005. When I refused to sign their prepared statements, the officers pushed me down on the floor. Officers from the Tuanjiexincun Police Station have closely monitored, followed, and harassed me ever since. I have lived in terror for a long time, and often wake up in the middle of the night, fearing I will be arrested again. When I fled to Beijing in 2002, my sickly parents, who live in Sichuan Province, were intimidated, threatened, and monitored. Even today, my mother still trembles in fear when she sees a police officer or a police car. The persecution has led to the deaths of many Falun Gong practitioners during the past 16 years. More have been tortured for their beliefs and even killed for their organs. Jiang Zemin is directly responsible for the inception and continuation of the brutal persecution.